Known to everyone, this classic story of the Fall of Man, or of Adam, comes from the book of Genesis. While in a land of paradise and bounty, The Garden of Eden, Adam and Eve felt no shame walking around naked and had no fear. God told them to never eat an apple from a certain tree, the tree of knowledge. Eve, tempted by a serpent, ate the apple and then gave it to Adam. God found out and banished outside the garden and live mortal lives in shame. This story is often interpreted as providing the logic for original sin. Hence degradation and shame are the main themes in the painting. Adam and Eve have sinned and have moved away from God. Eve with an expression of grief and agony with an open mouth looks to the sky with despair trying to cover herself while Adam hides his face in his hands and in turn exposes himself even more. The depiction of Adam and Eve is almost horrifying. The narrowness of the painting itself distorts the painting and seems to stretch the characters. The shear agony expressed in Eve's face as she looks up is unsettling and portrays a very powerful sense of shame and pain. Adam and Eve are marked with two deaths. The first a spiritual death, they have sinned and have separated themselves from God. And the second death is a mortal life. There are four key images in the painting: the angel, Adam and Eve, the arch and the wilderness. •	Adam and Eve represent of mankind and their banishment from Eden could be marker or a reminder of our original sin. •	The angel over head is a representation of the church as the angel is a messenger of God. •	The wilderness is where they are banished to. In the wilderness good, evil and taking a decision between the two are necessary. •	The arch is a symbol of Classicalism and holds resemblance to the Arch of Constantine in Rome. Firstly, Adam and Eve are naked in the scene. In the Bible it states, "And the Lord God made skin coats for the human and his woman, and He clothed them,"
Secondly, it is most likely that there were more than one angel present at the exodus. The Bible uses the word Cherubim, with the suffix -im being plural. The angel in this rendering is holding a sword and directing Adam and Eve into the wilderness. And thirdly, there is no arch in the biblical story. 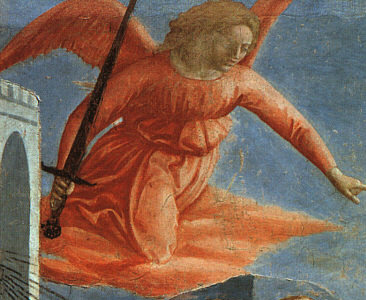 It can be speculated that Masaccio did not have knowledge of the plural suffix or simply did not care to put more than one angel into the painting. As to why Masaccio wanted to paint naked figures, it probably is a reflection of the desired theme: Shame. It has been argued that the arch symbolizes the perfect world and Adam and Eve leaving paradise through the arch is apt, as paradise is perfect, but it seems strange the classical world would symbolize perfection to a humanist and not knowledge. Masaccio valued the Classics for science, human form, perspective and the actual. Also things from the wilderness did not often pass into paradise. It could be interpreted that the arch serves for the departing as an entrance into the wild. It is also interesting to note that the light in the painting comes from the right hand side of the painting. The light is supposedly coming from the wilderness and possibly Jesus who went into the wilderness to save mankind. 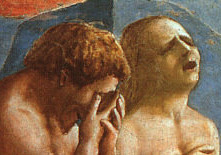 The use of light might be thought to have been better employed to come from the Garden of Eden as they are leaving glory behind them but Masaccio puts the light before them either to expose their bodies further as now in the wilderness their nakedness is horribly honest and shameful, or as a beckoning for mankind. The black lines coming out of Eden and almost striking Adam on the back are thought to be God's words, his condemnation of Adam and Eve.